On our kayak tours on the B.C. coast, guests are given the opportunity to paddle a variety of different kayaks from most of the major North American manufacturers. The question we get most often about our gear is whether we use single or double boats (we use both! ), but there is a lot more to know about kayaks for those interested in learning more. Below we’ll answer some other popular questions. Sea kayaks come in a wide array of materials, shapes and sizes to suit a variety of intended uses. However, they are still designed based on traditional principles that have existed for centuries. 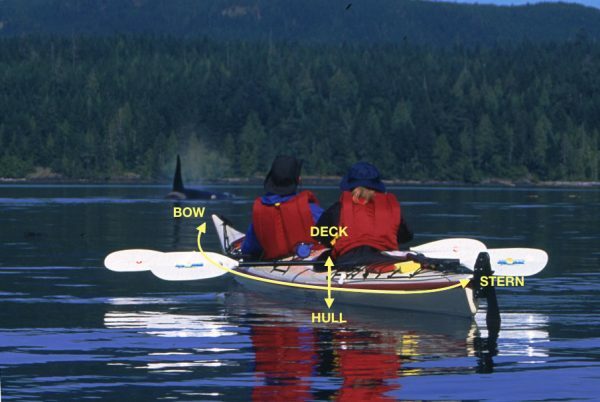 The front of the kayak is called the ‘bow’ and the back of the kayak is called the ‘stern.’ The top and bottom of the kayak, are called the ‘deck’ and the ‘hull,’ respectively. Kayaks usually have two ‘bulkheads’ or walls that separate the bow and stern cargo compartments, or hatches, from the cockpit (where the paddler sits in the boat). 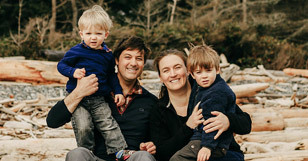 They provide the boat with dry storage for long trips and ensure that in case of capsizing the kayak will keep afloat even when the cockpit is full of water. The length of the sea kayak is one of the major factors determining its speed. Length also provides the kayak with its ability to stay on course – a quality known as ‘tracking’ – as well as its storage volume. A shorter kayak will be slower, but easier to turn and manoeuvre than a longer kayak. The ‘beam’ is the widest part of the kayak. The wider the beam the more stable the kayak will be but the slower it will be to paddle; a narrow kayak will be faster but at the expense of stability. WHAT IS CHINE? WHAT IS ROCKER? 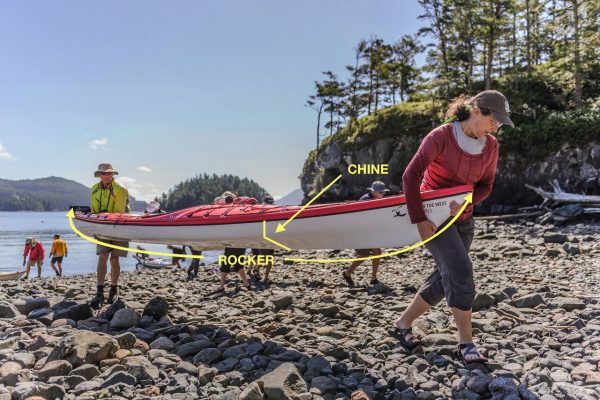 The point where the hull of the kayak turns upward and becomes the sides of the kayak is called the ‘chine.’ The chine can be soft, which means it has a smooth, rounded shape, providing good stability on flat water, and easier bracing and rolling. The rounded shape also enhances speed. A hard chine is a sharper, more square shape; it enhances tracking, and stability when water quality is poor and the boat is likely to be tipped on its side. ’Rocker’ is the degree to which the bow and stern are curved upward. As the amount of rocker increases, kayaks become more playful and easier to turn. Too much rocker can make progress in a straight line difficult, too little, and the kayak may track well, but be hard to handle and turn in rough conditions. A well-designed sea kayak should go straight on flat water. This becomes more difficult when paddling at an angle to wind or in waves. 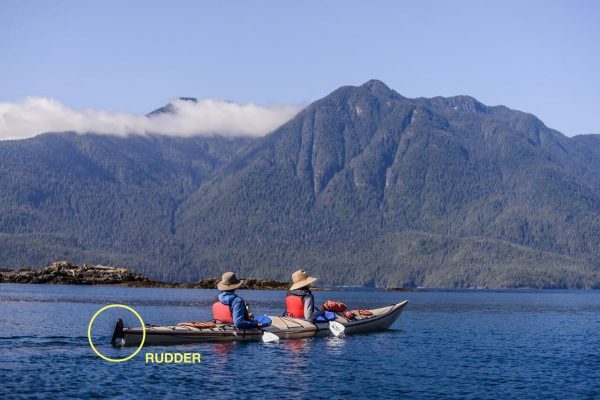 A rudder, operated by foot pedals, can reduce the need for constant corrective strokes. Similarly, a ‘skeg’ is a simple fin that lowers from a box at the back of the kayak to increase the boat’s ability to track. A skeg cannot be controlled with foot pedals in the way that a rudder can, but it is less likely to be lifted out of the water in waves, and it creates less drag in the water than a rudder. The material of a kayak affects its durability, weight and price. Plastic or Polyethylene is inexpensive, and very impact and abrasion resistant. It does, however, have a finite lifespan and can eventually become brittle or warped in shape. Plastic boats can also be heavy. ‘Composites’ includes fiberglass, synthetic and carbon blends; they are durable and lightweight, but typically more expensive and not as impact and abrasion resistant.